Tamagotchi are back! Since their original United States release in 1997, it has been 20 years since the kawaii collectible keychains have dominated the hearts and allowances of kids everywhere. But now, the original pocket monsters are is finally getting a revival. 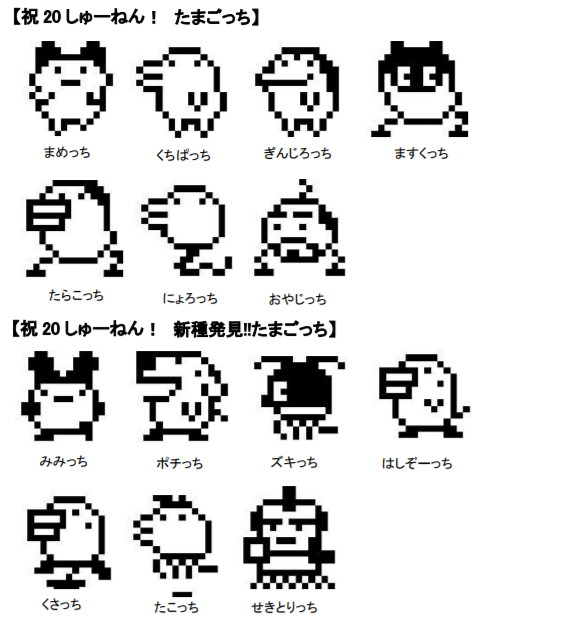 Bandai just announced the 20-year anniversary edition of Tamagotchi, and is planning to release them in toy stores in Japan (and, presumably, the English-speaking internet) this month. Tamagotchi (the name a portmanteau between “tamago,” the Japanese word for egg, and “gochapan,” collectible Japanese capsule machine toys), holds a special place in the hearts of millennials in America and Japan. Rising to prominence around the Pokemon golden age, these cute little digital creatures required constant care. They were carried all over, clipped to the side of elementary school backpacks on both sides of the world. Everything about these throwback toys are going to be just like the original. They’re coming in the six classic color schemes and wild 1990’s packaging. They function just like the old toys that you know and remember fondly. Players will be able to raise, care for, feed, and shovel the poop of their pets, just like collectors used to do decades ago. The creatures you can get in your Tamagotchi, though, will be a bit different. Either you’ll get one of the seven “standard” species, or you’ll end up with one of the seven new species! The only thing not so exciting about this re-release is the price of the classic toys. Bandai will sell the new Tamagotchi for 2,916 yen, which comes out to about $27 USD. Though those looking for a nostalgia fix will be more than happy to fork over the cash, parents of kids might be a bit hard fixed to pay this much for a small hunk of plastic and LED.